Note: Article management permissions are limited on Guide Lite. You can allow all agents and managers to edit and publish an article or you can limit it to managers only. Depending on your account, you might also have an Agents and managers management permission pre-generated for you. You apply permissions at the article level, not the section level. Guide Managers can apply any management permissions to an article. Agents can apply only the management permissions they belong to. Tip: You can update permissions for articles in bulk (see Updating articles in bulk). If you want to set permissions for all articles in a section, first create an article list filtered by the section, then update the permissions for those articles in bulk. Management restrictions do not apply to Guide Managers. Managers can edit and publish all knowledge base content, regardless of the management permissions. In Help Center, navigate to the article where you want to change management permissions, then click Edit article in the top menu bar. (Guide Enterprise only) Click Article settings at the bottom of the sidebar. Options vary according to your plan type. On Guide Professional and Enterprise, you can choose a pre-built option or a custom management permission (see Creating management permissions to define agent editing and publishing rights). Guide Managers can apply any management permissions. Agents with management permissions can apply only the management permissions they belong to. Agents who do not have management permissions on the article cannot change this option. Note: On Guide Enterprise, agents must have publish permissions on this article to change management permissions for the article. Agents with only edit permissions on this article cannot change the management permissions. I'd like to request the ability to have more granularity with who can manage areas of the Guide, in general. I really need the ability to separate "Arrange Content" and "Customize design" agent access in the Guide. Thanks for the great feedback. 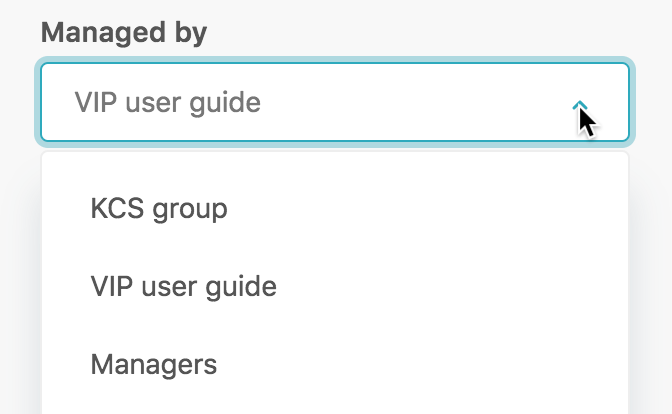 I think our Product Managers would like to read about it, but they don't scan all of the comments of our Knowledge Base articles - I encourage you to re-post this comment in the Product Feedback thread "Additional Guide Manager Permissions" where they'll see it. Let me know if you have any questions on that! Are there any plans to allow finer grained control over which agents (perhaps via groups) have add/edit permissions to sections in the help centre? Are there any plans to allow export of the help centre change history - we'd find that useful for communicating changes to the KB made in the last week for our partners that, for example, might do some translations. Yes! We have an early access program open currently that will allow exactly what you're looking for. You can sign up for it here. We don't currently have a specific export planned for that data, however there are many translation partners that have Zendesk Guide integrations. Typically this is done via the API and the article update information is available there. You can see some documentation here. Specifically if you look at the start_time parameter, you can get all updates from a certain time. I'll take a look at both. It seems that permissions only apply to existing articles. that all works great, but we also publish new articles every day and with these new permissions it seems that just everybody can add new articles in any category and section. We want our agents (not marked as guide managers) to be able to publish in one category/section, but not in the other. I know about the EAP program for Content Management, but we seem to be on a "Guide Legacy" plan while we have an "Enterprise" plan for all our other products (Support & Chat). We were told that we have to pay for the feature in the end, so enabling this EAP would be risky. What "plan" do I refer to to see what I can and cannot do? Professional or Enterprise?